Playa del Carmen is often defined in comparison to its better known neighbors -- Cancun and Cozumel. The contrast with Cancun is sharpest. Although located only 40 miles south of Cancun, Playa del Carmen is worlds away in terms of appearance and outlook. You won't find the high rise mega-resorts that dominate Cancun in Playa del Carmen. Nor will you encounter the huge crowds that testify to Cancun's popularity as a tourist destination. Playa del Carmen (known locally as "Playa") has more in common with Cozumel. The differences are attributable mainly to geography. As an island, Cozumel stands apart from the rest of the Yucatan Peninsula. The island can also be a beehive of activity, especially when as many as a dozen cruise ships unload their passengers in a single day. So now that you know what Playa del Carmen is not, exactly what does it represent? Locals will tell you that Playa del Carmen is everything the Mexican Caribbean should be. It brings together beautiful beaches, pristine waters, easy-going hospitality, and lively nightlife -- all in a tranquil setting. Any description of Playa del Carmen starts with the water. The Caribbean here is the same dreamy turquoise found up and down the coast. The water is clear and warm, and the beaches are a sparkling white, with sand the consistency of salt. 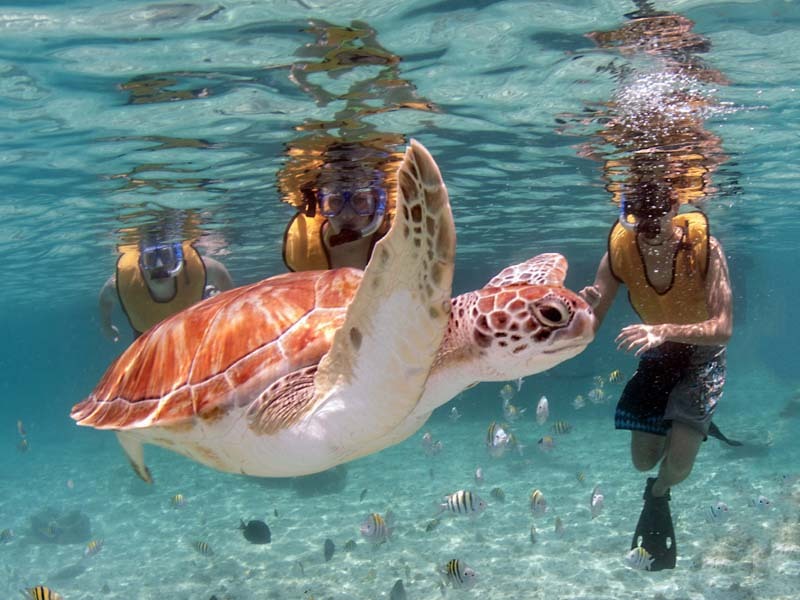 With only twelve miles separating Playa del Carmen from Cozumel, visitors to the area are within range of the same Great Maya Barrier Reef that has made Cozumel a favorite destination of scuba divers. In fact, the waters around Playa boast perhaps the greatest concentration of tropical fish in the Riviera Maya. Parrotfish, yellowtail, angelfish, damsels, squirrelfish, snappers, trunkfish, and other colorful species are all found in abundance. Playa del Carmen is also an ideal base for exploring the Mayan ruins and ecological treasures of the Yucatan. The two come together in a visit to one of the thousands of "cenotes" that dot the landscape around Playa. A cenote is a limestone sinkhole filled with fresh water, often bubbling up from a natural spring. The ancient Mayans thought of cenotes as a gateway into the world of the spirits. Although we now understand more about their origins, cenotes continue to leave visitors with a sense of awe. Like elsewhere in the Mayan Riviera, Playa del Carmen has been caught up in the wave of development that has transformed the region since the 1990s. The town was once a sleepy village and refuge for backpackers, ex-hippies, and other low-budget travelers. They have been gradually replaced by the expansion of the tourism industry and upscale real estate construction. Today's Playa del Carmen is fast gaining a reputation as a trendy, even chic, alternative to Cancun and Cozumel, with dozens of new restaurants and nightclubs. At the same time, Playa del Carmen has consciously avoided becoming a miniature version of Cancun. By law, buildings in Playa are limited to three stories. There are still plenty of quiet neighborhoods that are dominated by houses painted in tropical pastels, red clay roofs, and meticulously tended gardens. Mayan culture remains strongly rooted in the local customs and cuisine. And whereas the vast majority of Cancun's visitors are American, Playa del Carmen has gone out of its way to attract a more international audience. Any way you look at it, Playa del Carmen stands on its own as a vacation destination worthy of your attention.